Hyundai Motor Company, the popular South Korean auto giant, has showcased the Kona EV at the Move: The Global Mobility Summit 2018 in New Delhi. 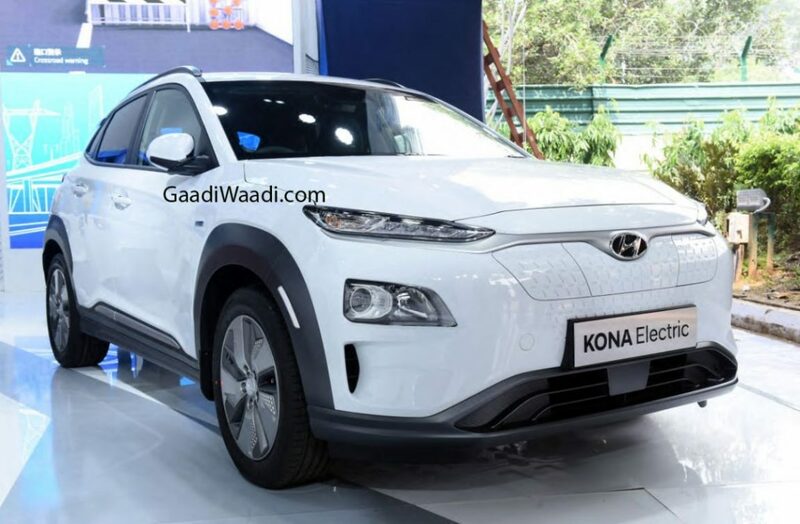 The Kona will be the first all-electric model from Hyundai Motors India Ltd. Unlike Toyota and Maruti, which will launch hybrid vehicles prior to their all-electric range, Hyundai has decided to straightaway start with launching EVs. The SUV will come to us via CKD route and cost roughly Rs 25 lakh. It will be available only at select Hyundai dealerships. The high price tag will be owing to the high import duties on electric cars. As per the current GST slab, there’s a tax of as much as 12% on import of electric cars. Hyundai is hopeful that this will be decreased to 5% in order to promote the introduction of EVs in India. Powering the Hyundai Kona EV is a 140 kW (204 PS) electric motor that is available with two battery pack options – 39.2 kWh and 64 kWh. The smaller of the two battery packs offer a driving range of 240 KMs while the bigger unit offers a driving range of 390 km. The peak torque is rated at 325 Nm. As is the case with all electric vehicles, the peak torque will be available instantly, which makes the EV very quick off the block. As per the figures provided by the company, the Kona can accelerate from zero to 100 kmph in just about 7.6 seconds. Couple that with a claimed range of 390 kms, and you have a car that’s not only quick but also quite practical. The Hyundai Kona will be sold with a home-charging kit for recharging battery easily using household electric sockets. The battery pack of the Kona can be charged completely in just 6 hours. Stay tuned to Gaadiwaad for more updates on the India-bound Hyundai Kona.